Hmmm, I see that I’ve actually only reviewed two Pinot Gris (although one of those was the 2014 Deviation Road wine) and already I find myself thinking “I must find something interesting and different to say about the grape”. To that end, I turn to Wine Grapes and I hope I’ll find a titbit that is as interesting to others as it is to me. Perhaps not – because the more obscure the wine trivia, the more exciting I find it. But bear with me, because I’ll follow it with some words about a lovely wine. Pinot Gris is a colour mutation of Pinot Noir and has something of a muddled history in Europe. While generally considered a white wine grape, its colour is variable and can be quite dark – even, apparently, as dark at Pinot Noir. For the most part, if you stick with the idea that it’s a pinky grey (the grape, not the wine – the wine is usually very pale! ), you’re on the right track. Unsurprisingly, for anyone who has suffered one too many pub Pinot Grigios, while it is grown throughout Europe, the largest plantings are in Italy. It is also found in the Americas, Australia and New Zealand. Wrapping up the rest of the world, a tiny amount is grown in South Africa and … (and this is the really exciting wine geek fact!) Japan. 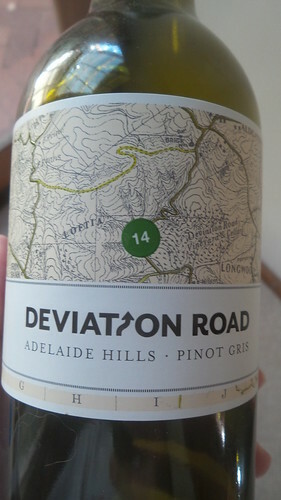 I’m an unashamed fan of the Deviation Road wines in general, and last summer the 2014 Pinot Gris was a definite highlight and this wine kicks those same goals. Yes, you can go out and buy cheaper Pinot Gris (and probably even cheaper Pinot Grigio!) but with Christmas around the corner, you should treat yourself to a bottle which you pop in the fridge and keep ready for a hot evening. Pale straw in colour. The nose is quite pronounced and shows some rich oiliness as well as fresh pear, pear drops and even more super ripe pears. In the mouth those pear and pear drop characters show up but there’s also refreshing lemon (and good acidity) and lemon pith for added texture. The finish could almost be described as savoury. The wine smells, tastes and feels lovely. For me, this wine ticks the boxes of being both interesting and delicious, all in the one package. Deviation Road Pinot Gris, sample. RRP $28. I am a little fussy about my Pinot Gris. Those made in the more neutral Italian style (and so generally labelled Pinot Grigio) I find lacking in interest. This may be the fault of English pubs, who for so long served dull, dull, and cheap Pinot Grigio as the standard house offering. But those made in the more textural (wine wanker word, I know! ), savoury and intense Alsace style (labelled Pinot Gris) I do find myself getting along with. The Adelaide Hills in particular appears to be a happy hunting ground for this style of Pinot Gris. My experience thus far leads me to believe that these are wines that generally benefit drinking young and that the wineries that are getting ‘it’ right are getting ‘it’ right consistently. Deviation Road is one such winery. I am a huge fan of Kate and Hamish Laurie’s Longwood outfit (although, despite living about half an hour down the road, I’ve never got myself to the cellar door). I’ve been lucky enough to sample their new releases a couple of years in a row, and around the middle of last year I interviewed Kate for an essay. Kate is probably the easiest interviewee I’ve dealt with ever. So I have a massive soft spot for these wines. I was impressed by the 2013 Pinot Gris so I was keen to have a look at the 2014. 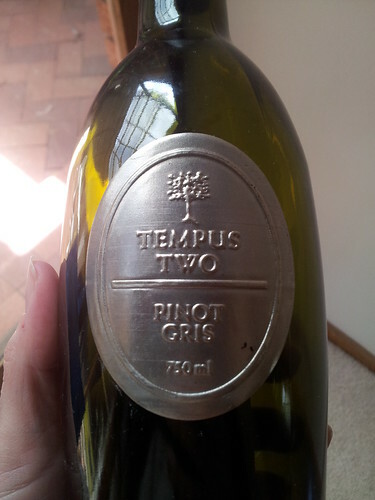 In addition, I’d very recently tasted the Pinot Gris which had picked up several gongs at the Royal Adelaide Wine Show. I’d been rather underwhelmed by that wine but I was interested to see how the Deviation Road equivalent (at almost twice the price) would stack up. In brief, the Deviation Road more than stacks up. 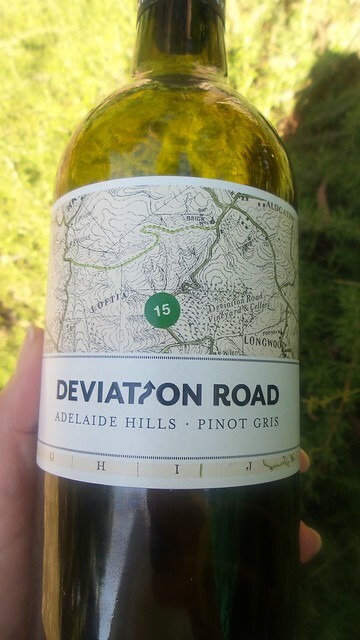 I would much rather have, enjoy and savour one bottle of the Deviation Road Pinot Gris than the equivalent two bottles of the medal winner. This just proves to me (yet again) that while wine shows have their place, punters need to be aware that not every wine is entered and the show results are best viewed as a rough guide, rather than a definitive state of the nation. The nose shows quite pronounced pear and pear drop characters, with some green apple and slight melon. The palate shows off the pear – ripe, but not overripe and none of the potentially confected pear drop that I saw on the nose. Green apple, citrus and an all important touch of warm spice all make an appearance. There is good acidity, coupled with excellent mouth feel and texture as well as good length. I think that this wine more than demonstrates that it’s possible to buy wine that is both approachable and classy. With a recommended retail price of $28 it may not fall into your every day drinking price bracket but it is definitely worth every penny. Sample, RRP $28. Deviation Road is distributed by Negociants so it shouldn’t be too hard to track down and you can buy the 2013 through the Deviation Road website.